Cool Eli I will say this though, check your pepper seeds to make sure they'll grow in time to produce peppers this year. It takes a while for the plant to get established sometimes. Maybe someday when I retire. My ol' black thumb which is usually reserved for house plants has made a reappearance this year. I replanted my pepper and tomato seeds as I mentioned above and not a single thing sprouted. I'm not entirely sure what I did, though my best guess is that they germinated and I didn't water quickly enough so they died. It's too late to start them again so I will just have to buy my tomatoes and peppers this year. On the flip side, all of the plants in the garden are up except for the potatoes, and all are looking good. Last weekend I finally started planting my cottage garden, with about 20 plants put in. Have to get the lawn part sown, hoping to do it this afternoon or tomorrow afternoon. Before I do, there are some crocuses to put in the lawn (to pop up early in spring and be mown over later) and several packs of bulbs to follow the curved edge (the other side is against the path on the house side). Neighbours behind me chopped down their plum tree recently, leaving that corner of the garden very empty looking - so I will put in another apple tree there I think. Also want to get another rose bush to match one on one side of the steps up to the deck. Hope to hear from the deck builder soon, want him to do a quote for a fence that will screen it all from the street (and from prevailing winds). I have my first greenhouse coming within the next few weeks. I already have planned to grow tomatoes, thyme, and squash in it but I would welcome any recommendations people with more greenhouse experience might have. The size of the greenhouse is 8X10 feet, I am also trying to decide which kindof lighting to use for the winter months as we get around 5 hours of sunlight each day that time of year here. I went to the plant nursery after church today (it's just outside the city on the same side of town as church) and got the rose bush I wanted, but there were no apple trees I liked, so I bought a pear tree instead. I came home and planted them, sowed the lawn, sowed some carrot and silverbeet seed, and a nice row of sunflowers and hollyhocks. Then I watered everything, and even managed to mow the lawn. Tomorrow the weather will be cold, wet, hail, etc... in fact there'll be rain for most of the next week. I had never heard of silverbeets before coracle. When I googled it, I found out it's what we call it swiss chard over here in the States. Cool, learned something new. Cool about your greenhouse Hyperwing It sounds like it's the same size as mine, though mine is in need of repair. I only use it during the winter months to start seeds and protect my potted plants anyways. I would need to double check, but I believe my sister just uses a good fluorescent for her grow light. In fact, if you just google grow light, all kinds of good info comes up. I hadn't heard of silverbeets either. Our "Swiss chard" is an okay name, but I do prefer "silverbeet". Ahh, it's great reading about everyone's gardening. HyperWing, all the best with your greenhouse! 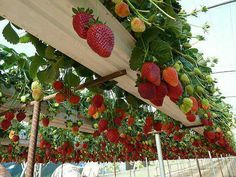 fantasia, that hanging strawberries idea is very cool! And attractive. coracle, did your gardens make it through that deluge all right? Sounds like your gardening is coming along well, shastastwin! The last bits of snow have finally melted here, plus with no precipitation for a couple of days, I was finally able to get out to the front yard, working much of yesterday afternoon at bagging the myriad of dead, dry autumn leaves hidden under and around bushes. What a job! But very satisfying too, as the garden beds all look much neater now. We want to dig other beds in the front—probably down the driveway a bit and up along the path to the door—and plant mainly perennials there. This afternoon I'm going to tackle the backyard, which has mostly branches and sticks on the ground from the winter winds and ice. We're beginning a perennial garden back there, as well. Still not sure where we're going to put our veggie garden, exactly, and so I may only plant a few items this year as we figure out the overall layout: tomatoes (for sure!) and probably peas and beans, plus a bell pepper plant. Glad you were able to do some cleaning Jo, though I hear you have more snow again to slow down your progress. I had an idea this year to try for my tomatoes. I took the section of hog fence I typically use, and put the two sides on the ground about 5' apart, and made a big arch out of them. Then I planted the tomatoes just on the inside in the hopes they can grow up the fence and I can easily get under it to weed and pick tomatoes. It ended up being a LOT taller than what I was expecting. I think it's over 6' tall. It was promptly load tested by my son who climbed up on top of it. But aside of the potential hazard of it doubling as a jungle gym, I think I like the results. I'll have to get some pictures to post in here. I did get all five of my tomatoes put in, and my two peppers. The only thing left to plant in the backyard are my sweet potatoes. My garden has managed well in the varied weather we have had. I'm grateful for drizzly or showery days, which give enough water. Today I noticed the start of lawn growth, which is always a great thing to spot. I've put in some seeds for poppies and for other wildflowers. There seemed to be nothing like enough for the area I was sowing, so I hope I don't find them all jammed together in the spring. The row of carrots is showing as a nice little row of jammed together tiny leaves, so will have to do thinning some time. Can't remember when I have grown carrots before, but it was a long time ago. Some parts of the garden seem damp and cold,(it is mid Autumn of course) and I'm thinking about finding plants that like less sun. Autumn is a time for putting things in and leaving them to grow. Hard to be patient of course. I must get some pea-straw to cover the garden with, to help keep it warm and to reduce weeds. My carrots and beets need to be thinned as well. Somehow that never happens though. Yesterday my husband informed me he still needs to plant green beans. Didn't know he was even planning on that. We should probably get those in soon. I did manage to plant the rest of my flowers in the front flower bed. I've done a lot of weeding, but it still needs a lot more. And then it needs to be hit with a lot of mulch. Rain doesn't seem to have spoiled the garden. A few of the hollyhock/sunflower seeds have produced first leaf shoots. Looking forward to seeing what they are. With how busy I was, I did not expect to have a garden this year. But I went back there this week, after finals, and surveyed how glum everything looked, without any plants that usually would be in there now, and how I had no garden to show guests when they came over, so I decided to try do what I normally do (tomatoes, peppers, and eggplant) with the only new exploration being an herb garden, but in containers. I bought the plants at a farmer's market, and I have three varieties of tomatoes: Better Boy, some Cherry type, and pink Brandywine. For Peppers, I did jalapeno, bell, and serrano. I finally found baby eggplants, too. The herbs are oregano, rosemary, dill, basil, and mint. I'm going to try dry them. But.. yeah. Nothing too fancy this year. Sometime in the future, I do want to try some type of squash, but I think this is going to be characteristic of my gardening for the next two or three years. Unless I change my mind and study horticulture. I got out today before our next round of rain and did a lot of hoeing and weeding. Everything looks great except for the grafted tomato I bought. Irony. I BELIEVE I am done planting my garden, at least for the spring. I got my sweet potatoes in last night and that should do it. I took some pictures and I really need to get them uploaded on here and/or FB. What a resourceful idea for your tomato plants, fantasia. Ahh, coracle, I planted poppy seeds the past 2 summers: such pretty flowers! I don't have any in this year, but hopefully another time. I did put in some sunflower seeds again this year, but I think the squirrels have been attacking some of them. I have got to get bloodmeal out there today yet! Yay for your garden, Bella! It sounds lovely. Yep, what a satisfying feeling it is to have completed planting, eh, fk? We are not getting a full veggie garden dug this year: there are enough new ventures to work at around our new home, so the larger plot for vegetables will wait until next year. Sure glad we have a couple of great Farmers' Markets in town. However, I could not live without home-grown tomatoes, so planted 2 Brandywines and 4 Cherry tomato plants, which are all thriving. We used our pool fence at our old place for support, as they grow quite large, and here we are using the side of our back deck. Plus I put cages up to help. But the plants always grow taller than the cages, so, yeah. We have dug a couple of perennial and annual gardens in the backyard, and filled them full of beauty. Now for a perennial garden at the front up along one side of the driveway (it's a long drive, so we're starting up halfway up), then curving around to follow the sidewalk to the front door. It has been too dry up until now to dig up that sod, but with the rain we had yesterday, the earth should be moist enough to move it to a new location, allowing me to plant the perennials I have purchased so far: stonecrops, daisies, hastas, hydrangeas, peonies, and a couple of others (can't recall what they are ). It's great being outside digging again ... with no concern for frost anymore! /edit/ Mind you, I love the feel and smell of the air when it frosts, but unfortunately gardening and frost do not work well together. It's fun reading about the coming of summer and everyone out in their gardens. My gardening friends here have started their plants indoors and bring them out to harden them (I believe that's the correct phrase - acclimating them to cooler 'real' weather outside). But the past few evenings have been so cool and crisp, with frost advisories nearby and even freeze advisories 'up north' that local have had to cover those plants at night. But soon the heat and humidity will be here and the growing season will start in earnest. We had to bring in some things a couple of nights the latter part of the week of May 18th because of frost, which was light, but still could have killed off those tender young plants. There has not been any here since then, though.